This carefully crafted ebook: “The Complete Plays” is formatted for your eReader with a functional and detailed table of contents. 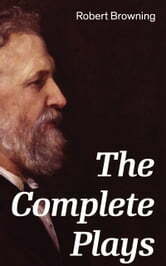 Robert Browning (1812 – 1889) was an English poet and playwright whose mastery of dramatic verse, and in particular the dramatic monologue, made him one of the foremost Victorian poets. Pippa Passes is a verse drama, which was dedicated to Thomas Noon Talfourd, who had recently attained fame as the author of the tragedy Ion. The author described the work as "the first of a series of dramatic pieces." King Victor and King Charles was the second play written by Robert Browning for the stage. The subject of the play is the strange incident in 1730–32 in the Kingdom of Sardinia in which the elderly king, Victor Amadeus II, first abdicated in favour of his son Charles Emmanuel III, and then after months of ever-increasing complaints unexpectedly demanded to be restored. He was imprisoned until his death a year later. Browning's treatment is based on 18th century sources which cast Victor as deliberately deceptive, but he goes further to create a secret history in which Charles is exonerated from all charges of cruelty. The play is in four acts and has only four main characters: Victor, Charles, Charles's wife Polyxena, and the minister D'Ormea.